For this group of enthusiasts—war is just plain fun! The armies receive instructions before battle begins at Estrella War 2008. Photo by Clarence F. Jacobs III. While political parties are arguing over who opposes the war or not, in the Society for Creative Anachronism (SCA) the opinion on war always runs favorable because war is the Woodstock of medieval recreation. The members of the SCA look forward to going to war like Nascar fans look forward to the Daytona 500. 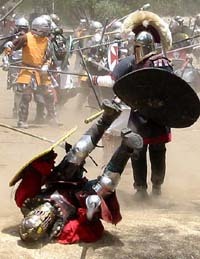 Other sports or rock fans attend large events to be spectators, but members of the SCA go to war to become participants in the battles. War is also a time to spend living a medieval lifestyle as closely as you can with all your best friends. castle wall at Pennsic 36. Photos by Ron Lutz II. It is difficult to describe an SCA war to an outsider. Wars are part sporting event, part renaissance fair, and part Burning Man. The world in the SCA is divided into 19 kingdoms and each one holds or participates in one or more wars each year. 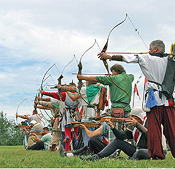 The largest wars are Pennsic with around 12,000 attending over three weeks in July and August in Pennsylvania and Estrella War with attendance of around 7,000 over one week in mid-February. Smaller, shorter wars are held around the country and in Europe and most members can find a war within reasonable driving distance. The central events of any war are the the massive battles where armored martial artists bearing sword and shield, or spears made of wood, foam, and duct tape, compete in armies numbering in the hundreds on each side. The object of the battle is determined by the leaders in treaty negotiations held months before the wars and may include scenarios like holding a bridge, sieging a castle, defending a breech in a castle wall, or simply meeting in a massive clash on an open battle field. Along with the large battles, every war also includes tournaments of champions where the best fighters can test their mettle one-on-one against the best fighters from other regions. These are always a treat for the spectators and much easier to watch than the large battles. Some of the tournaments are held to raise money for charities like breast cancer research. Action from Portrero War. Photo by Lars Adlerz. But fighting in armor is not the only sporting event at a War. There are also fencing tournaments and battles, equestrian events, archery, knife and axe throwing competitions, and even dog coursing. Children can compete in armored combat tournaments and battles by age group using softer weapons than the adults use. There are also arts, crafts, dance, music, storytelling, and even cooking competitions. After a day of fighting in the dust or rain, the fighters return to their tents to party around the campfires and that's when the fun really begins. This is no mild-mannered group of tailgaters. To start with, at any SCA war you will find one to twelve thousand people camping within a relatively small area. and they don't camp like wilderness hikers in itty-bitty tents eating freeze-dried meals. No—SCA camps are filled with large canvas tents, handmade wooden tables with table cloths and stoneware dishes. There are carpets on the floors of their tents and full-size beds with mattresses. Everywhere you look there are hand-made silk banners fluttering on the breeze. The smell of delicious food cooking over campfires and on campstoves informs you that feasts are being prepared. While you may meet many a minstrel or bard, you will never hear amplified or recorded music at any war. You don't hear children playing video games or watching TV either. They are playing games like tag, jacks, or marbles; and, they are having fun! After dinner people wander from camp to camp visiting friends, drinking and sharing stories about the day's battles; or, they participate in the late night activities like masked balls, concerts, belly dancing, song and storytelling competitions, and torchlight parades. 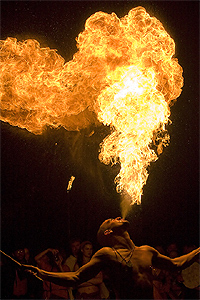 Exciting carnival jugglers, fire-breathers, acrobats, sword swallowers, and fire dancers provide entertainment at private parties held in fenced encampments. Occasionally bands of raiders create some good-natured mischief like kidnapping a queen or stealing a royal banner which leads to more adventures, drinking, and storytelling. Every war requires a huge staff of volunteers to make it successful. The people called 'autocrats' or 'event stewards' plan and direct the war and 'reeves' sell tickets and handle money. The team that manages the safety and smooth operation of the fighting are called 'marshals' and 'sheriffs' provide security. They don't carry guns or wear tin stars or cowboy hats. They do carry big sticks to push fighters away from the onlookers or hold the crowds back. Before the fighters can go into battle the marshals check each one to make sure all of their gear is safe. This is especially important since most of the armor is handcrafted and the variety is endless. Another crew of volunteers hands out water to the participants to make sure that they don't get dehydrated. Volunteer first aid teams called 'chirurgeons' and professional paramedics provide help round-the-clock to anyone who is injured or in distress. This might include anything from treatment for a sunburn to transporting a patient to the hospital in an ambulance. The larger wars also have professional firefighters on site. on Merchants Row at Pennsic War. Left: a potter on merchant's row. Unlike modern sports, there are no uniforms for the fighting teams here. Instead everyone wears their own heraldry or symbols. This requires many volunteers called 'heralds' to register all the different heraldic devices. Heralds also act as the announcers in the tournaments and in court. Courts are not for trying criminals but a time for awards ceremonies, announcements, and entertainment. Kings and Queens from several SCA Kingdoms preside over the courts which are always full of colorful spectacle. Since there is no PA system, 'town criers' make announcements throughout the day in every part of the encampment by walking and yelling! A big highlight of war is shopping on Merchants Row. This is an area filled with hundreds of merchant booths where you can buy anything you need for participating in SCA events. Lots of the merchandise is handmade and unique, but Merchants Row is so much more than a crafts fair. There is no way to describe the variety—you have to see it to believe it. Some of the most popular booths sell clothing or armor that is hard to make at home. There are also merchants who make weapons and replica jewelry based on historical models. There are potters and blacksmiths that will take custom orders and shoemakers that make leather shoes on site. There are also traders who resell unusual items from distant lands, as well as books, tools, fabrics, leather, and fur. Best of all there are food booths where the weary shoppers can grab a bite and listen to entertainment by wandering minstrells like Wolgemut. 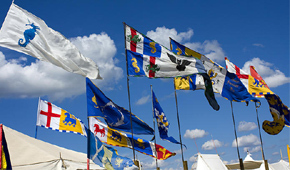 Heraldic silk banners at Pennsic War. Photo by Ron Lutz II. There is no requirement to become a member of the SCA to participate, but there are advantages to membership. You get discounts at events, a monthly newsletter, a subscription to the quarterly journal, and the right to participate in official business like holding an office or receiving awards. To attend a war all you need is to buy a ticket, wear medieval clothing—which can be purchased at the war or through this website, www.Renstore.com—bring camping gear, and money for food. If you have never gone before, take lots of pictures, ask lots of questions, and be prepared for both good and bad weather. Here is a short list of SCA wars and when and where they are held. Tickets are on sale now for Estrella War on the official website at http://www.estrellawar.org. The price is $65 per adult—with a $10 discount for members—for a whole week of camping, battles, and shopping. You can save yourself hours of waiting at the gate by pre-registering online. Estrella War will be held Monday, February 8 through Monday, February 15, 2010, in Florence, Arizona. CBS Sunday Morning segment on Gulf Wars that first aired in 2000. See more photos of various wars by Clarence F. Jacobs III and Ron Lutz II. Still can't get enough? 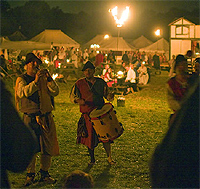 Here are many more photos of Pennsic War by various photographers. If you want to add this article to your list of favorites or email it to a friend, please use this permanent URL, https://stores.renstore.com/-strse-template/0809B/Page.bok. Permission is granted by the author to quote from this page or use it in handouts as long as you include a link back to Renstore.com.